kbculture: It's [Trade] Show Time! 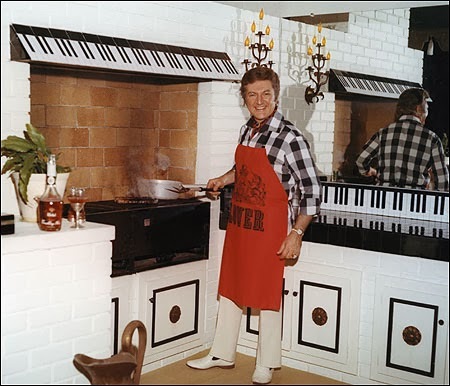 This utterly candid photo graces the dust jacket of Liberace Cooks!, a collection of recipes which the pianist published in 1970. [A note to the devoted: Inscribed copies can be found online for anywhere between $250 and $450.] For me, Mr. Showmanship epitomizes Las Vegas, which is where I'm bound next week to report on the 2014 Kitchen and Bath Industry Show. Alas, while I don't expect to come across piano-themed vent hoods or cabinets with a Hollywood Regency pedigree—although you never know—I'll be posting photos, comments, and videos on the @kbculture Twitter feed over the course of the conference.